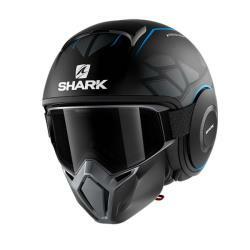 Helmet Shark Helmets model Drak . This helmet embodies a style all its own , extremely aggressive and at the same time unique , because of the presence of the mask with integrated chin . 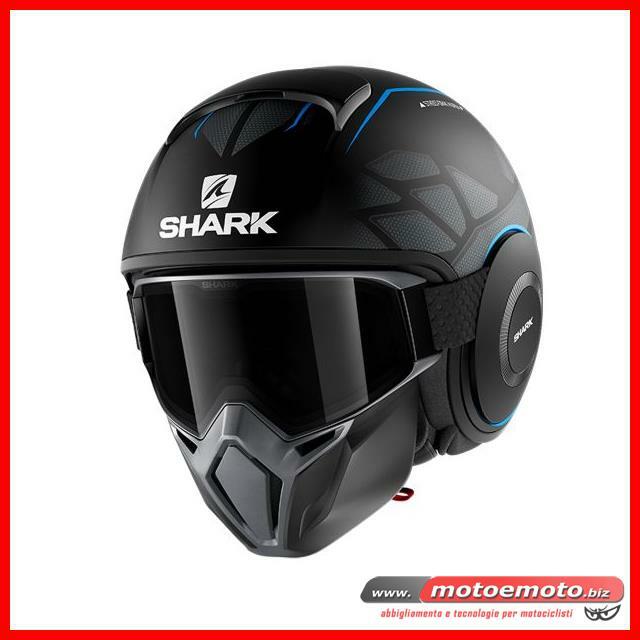 The shell is made of polycarbonate and includes a large upper air intake inspired by the world of aviation . The glasses are fastened to the helmet by means of elastic side and can still be dropped . Alternatively you can bring the mask in the upper part of the cap since the elastic fixing can slide inside their housing . The front to the chin is also removable in order to adapt the look of the helmet to your preferences , allowing you to use it even with glasses . The interiors are made ? ?of natural fibers and fully removable for washing . You can wear a helmet with eyeglasses thanks to Sharl Easy Fit .